Small businesses have done well but Canberra has missed out on infrastructure spending according to speakers at a 2017 Federal Budget Breakfast in the Great Hall of Parliament House this morning. “The ACT has been overlooked when it comes to the big infrastructure spend,” Labor’s Shadow Assistant Treasurer Andrew Leigh told the 500-strong audience this morning. Federal Minister for Small Business, Michael McCormack, spoke first at the breakfast which was hosted by the Canberra Business Chamber and the Institute or Public Accountants. He emphasised the Federal Budget’s benefits for small business, particularly extending the $20,000 instant asset write-off program to June 2018 and a $300 million incentive to the states and territories to cut red tape. “Last night’s was a budget for all Australians,” Mr McCormack said. Issues to come under the spotlight at the breakfast included cutbacks to Catholic school funding in Canberra, university funding cuts, measures to address housing affordability problems and moves to increase the Medicare levy to ensure that the National Disability Insurance Scheme is fully funded. During questions from the floor, concerns were voiced about funding cuts for Canberra Catholic schools which have been confirmed despite an overall $18.6 billion increase in education funding over the next 10 years. “Not a single dollar in the next 10 years goes to a single Catholic school in the ACT,” said Catholic Education Office Archdiocese of Canberra & Goulburn director Ross Fox from the floor. The 2017 Federal Budget commits to a massive $75 billion spend on infrastructure but the ACT is the only State or Territory to miss out – receiving just $1 million for the Pialligo Avenue Duplication planning stage and $500,000 for the Monaro Highway planning stage from Canberra Avenue to Hume. “It is disappointing to see no significant new infrastructure projects for the ACT in such a large infrastructure-spending budget which invests heavily in all States and the Northern Territory, but notably excludes the ACT,” Canberra Business Chamber CEO, Robyn Hendry said. However, Ms Hendry praised the Federal Budget for delivering continued support for small business. “Ninety-seven per cent of businesses in the ACT have less than 20 employees, and those with less than $10 million in turnover will welcome the extension of the $20,000 instant asset write-off provision,” Ms Hendry said. 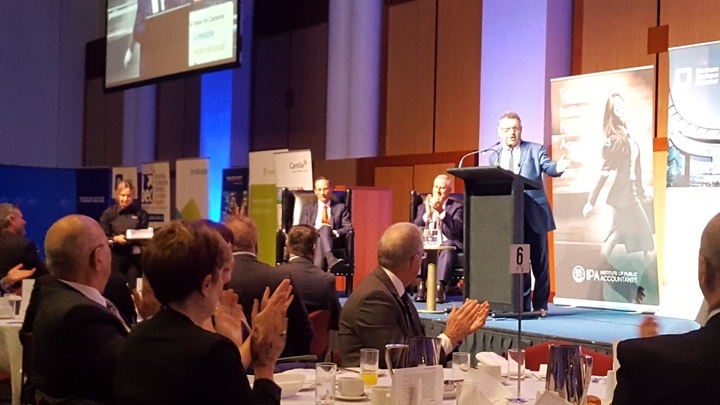 Photo: Compere Steve Price addresses the 500-strong crowd at the 2017 Federal Budget Breakfast in Canberra this morning. Revenue is a focus of this year’s Federal Budget. How the public sector fares in the Budget. Catchup on our LIVE coverage from Hotel Realm: Andrew Sykes from RSM Australia dissecting “The Rocky Horror Budget”. It was just a jump to the left for Malcolm Turnbull, but still a step to the right with continued attacks on public service pay growth and decentralisation. The impacts of the Budget for Canberra are in the detail – not the headlines. Federal Budget 2017-18 – RSM overview. Federal Budget 2017-18 – RSM pdf presentation.